Our most popular program for kids ages 4 and up. You climb and our friendly guides do all the safety work– belaying, coaching, motivating and sharing the local Whistler vibe. Sessions are sold in one-hour blocks and price is dependent on the number of people. All levels welcome. Reservations recommended. No experience necessary. Suitable for climbers with any level of experience the Climb and Dine is an all time Whistler favourite. 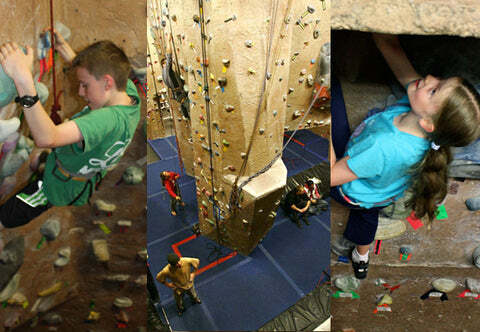 This class provides a safe and positive environment for kids to explore the vertical world of rock climbing. Our qualified guides do all the safety work while the kids enjoy indoor climbing, activities and a kid's style dinner with others from around the world. An assortment of climbing games and movement exercises are used to develop body awareness and provide a fun learning experience. *Online bookings available for advance 24 hour bookings only. Four hours of fun packed indoor and outdoor kid's activities! Four hours of fun packed indoor and outdoor kid's activities! Summer camps include a mixture of indoor climbing and outdoor activities and games, including "Kiss the Sky" trampoline. Winter camps include a mixture of indoor climbing and outdoor activities and games including a ride up the Excalibur Gondola to the Tube park where you will feel the wind in your face as you fly down the mountain.